When you chop or mince garlic, a magical property is released. That property is called Allicin. 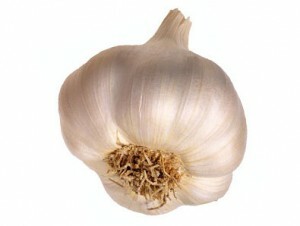 Allicin and other essential volatile compounds in garlic have anti-bacterial, anti-viral, and anti-fungal activities. Perfect for Lyme disease patients! Studies have shown that allicin is so powerful it is effective against the antibiotic resistant bacteria MRSA which can be rampant in hospitals. Allicin breaks down to more than 100 bioactive compounds that interact and combine with one another. As these compounds combine, they form thousands of new therapeutic combinations that microbes can’t easily circumvent. Garlic stimulates natural killer cells, the infection-fighting white blood cells of the immune system. It is also an excellent source of potassium, iron, calcium, magnesium, manganese, zinc, and selenium. Don’t worry about the smell for now. Sometimes I will chop garlic, put it in a tablespoon of something (like unsweetened applesauce) and swallow, chase with lots of water. That seems to minimize the smell. But again, smell or no smell, think about what we are going for here, 100% Recovery! There is no question garlic needs to be part of a serious wellness regime. I juiced 7 cloves of garlic a day when I was in the acute phase of Lyme disease and then I would eat at least 2 or 3 more raw cloves each day. Needless to say, my body became a very inhospitable host to pathogens. After long conversations with researchers out of Stanford University on the subject of garlic, I am not convinced that you can get the power of allicin, AKA raw garlic, from any supplement. I know there are a lot of garlic supplements out there and I know there are a lot of claims. But I don’t buy it. I stuck with raw garlic for my Lyme disease and Lyme symptoms. If people around you complain about the raw garlic smell, politely smile and say, this is what I have to do for now. If they love you they will want you well and not be petty about a garlic smell. Try to get as much in as possible. Do take it with food so it doesn’t bother your stomach. Because it is so powerful raw garlic could cause you to herx. But remember, herxing is good! So try to get in as much raw garlic as possible to recover from Lyme disease and Lyme symptoms. Aim for a whole bulb in different ways each day. Cooked garlic is OK too, but you’re not going to get as much out of it. Raw garlic packs the MOST powerful punch! Too your good health! 100% Recovery from Lyme disease!! Garlic is an inexpensive helper in your Lyme disease treatment plan! Garlic is powerful against Lyme disease and Lyme symptoms! PS Sign up for the Free 100% Recovery Newsletter if you would like recipes etc. and more tricks on how to get raw garlic into your diet. For those of you who’ve already signed up, sorry I haven’t gotten a newsletter out yet! Coming soon!! And of course I’d never share your e-mail, etc. This is just about getting people well from Lyme disease! !